We did our video shoot at McKinnon Furniture’s wood shop and showroom yesterday and it was a hoot. My cameraman extraordinaire Johnathan Iishi and I spend the entire day with Sheila McKinnon and Theresa Schneider and their amazing craftspeople who demonstrated every step in the process of hand making McKinnon’s fine furniture, furniture that will literally last for a lifetime. Walking through the showroom yesterday afternoon, I was once again struck by how incredibly beautiful McKinnon’s hand crafted furniture is and how many pieces I have plans to buy in the near future. Johnathan is in the process of editing the footage and we should have finished videos of varying lengths for you to view in the next few weeks. During the shoot at the wood shop yesterday, Sheila and I had a chance to chat and I told here about the great article in the Atlantic Magazine regarding manufacturing in this country that I did a post on the other day. That got us talking about the critical importance of community colleges and trade schools in preparing young people in this country for jobs in manufacturing and wouldn’t you know it, Sheila is involved in that effort as well! I guess making the finest handcrafted furniture available just isn’t enough of a challenge for Sheila. Actually, it is just yet another example of Sheila giving back to our community in Seattle. Sheila is involved with South Seattle Community College and its furniture craft training program. Sheila and I are planning a video shoot at the furniture program if we can get approval from the College, so stay tuned. Finally, I just wanted to bring to your attention two American made products that have made my life in the kitchen a whole lot easier. I love to cook and I love cheese, so it is not surprising that I love to cook with cheese. I prefer to grate my own cheese rather than buy it pre-grated; it has far more flavor and aroma when you grate it yourself. But for years, I was never happy with the graters on the market. 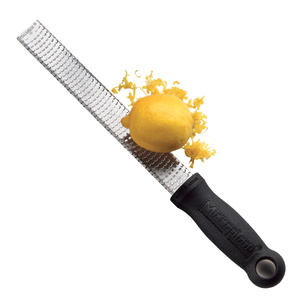 Then, a couple of years ago, I found the Microplane zester/grater. This thing works like a charm for grating Parmesan or Romano cheeses and ginger as well as zesting lemons, limes and oranges. Available with a green, red or black handle, this utensil is flawless in its operation. The other kitchen tool I highly recommend isn’t for making food, it is for cleaning up the dishes, pots and pans after the meal is over. 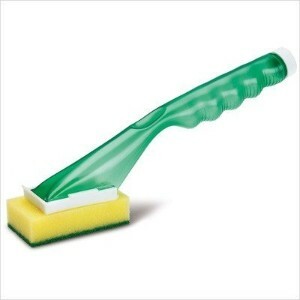 The Libman Dish Scrub & Soap Dispenser makes doing the dishes a snap. The Libman Dish Scrub and Soap Dispenser is 7″ long, and has a “see-thru” contoured grip refillable handle. You fill the handle with dishwashing soap and then go to town on you dirty dishes. You can buy replacement scrubby Polyester sponge pads when the pads wear out. The built-in scraper is great for a first scape on pans before using the scrubby sponge to finish up the job. We keep our Libman workhorse out all the time next to the sink. It truly is a great American made product that has made my life easier. And while I don’t like doing dishes, it’s a little easier knowing that members of my extended American family made the scrubber I am using to finish the job. Now if only I could train my son Benjamin to use it. Fat chance! This entry was posted in american made, Kitchen, Made in America, made in usa, shopping and tagged Cheese, Furniture, Libman, McKinnon Furniture, Microplane, South Seattle Community College. Bookmark the permalink.